Beorn might as well have been a deleted scene. While his presence made sense in the book, he feels like a very extraneous part of a movie filled chock full of extraneousness. The Silvan Dark Elves were indistinguishable from the rest of Jackson’s elves. Unless Jackson is saying that only Tauriel was a Silvan elf (hence red-head), which I think he does, because I’m pretty sure there was some dialogue suggesting that she was a Silvan elf as opposed to Legolas (and hence Thranduil)*. If Jackson had wanted to pad or elaborate, he’d’ve had a great opportunity here to explore why the elves in the Hobbit were so different from the elves in LoTRs, or at least show that difference. Being dark elves, they would’ve probably been a bit more worldly, more like classic fey, since they’d rejected their gods offer of heavenly paradise on account of it being an insufferably long walk to get there. Instead of weird ‘different’ elves, we got more orcs to constantly be running from. Action went from over-the-top to cartoon. Like, at this point, the Rankin & Bass Hobbit feels like a much more serious film. All of the scenes with Smaug were enjoyable, but the rest of movie falls pretty flat. The obscene death-counts in what are essentially kids movies these days have gone to where they make those 80s ‘omg shocking highest death-counts in film evar’ flicks seem pretty tame. DoS is a film filled with perpetual and casual violence from beginning to end to the point where you both forget that it’s there in the movie and forget that it’s not there in the books. *Update: Thranduil and Legolas were Sindar, making them part of the handful of Grey Elves and High Elves who stayed behind during the 3rd age to rule over kingdoms populated by the various Nandor and Avari populations of Dark Elves. Most of the Elves left in Middle Earth by the Third Age are probably these “Dark Elves” since most of the High Elven Noldor and Grey Elven Teleri prolly died when the entire world west of the Blue Mountains sank. We finally had the encounter that the whole game was leading to. An 8 year old with the Hand and Eye of Vecna and some elf-vampire-martial-artist thing that had 5 attacks per round + counter attacks and rolled an uncanny number of crits are in the temple of Wee Jas performing some ritual that all of the folk in the city are attending. A dozen orphans are around the altar feeding a black energy. The First round resulted in my getting a solid hit on the big bad, her dragon laying out the Ninja deep into negative territory, the Cleric casting a buff, the Bardbarian raging and the Psionicist doing some melee damage. In retaliation for my 40 points of damage, Vecna makes me magic-sick. Also in retaliation, the Vampire puts me at a negative, but the priest’s blessing kept me from going down double digits. The psionicist disintegrates Vecna for a lot of damage, putting him in the triple digit area of cumulative damage. The Cleric heals me and the Bardbarian does a pittance of damage to the Vampire. Vecna utterly destroys the Psionicist, who failed her fort save against instant death. The Vampire curb stomped me down to 4 HP on her way to take out the Cleric. The Bardbarian at least manages to KO the aspect of Vecna. While the Vampire starts grappling with the Cleric, I figure my best bet is to go over and try to destroy the altar of evil. The Cleric and Vampire struggle, and the Bardbarian who was complaining that he couldn’t use his songs while he raged had stopped raging and decided he would try to use his shout to destroy the Altar. While I was there destroying the Altar and there were a dozen orphan children standing around it. The Altar takes 30ish sonic damage, the children take 30ish sonic damage, I take 30ish sonic damage, the amulet of fireballs I’m carrying takes 30ish sonic damage, exploding and causing an additional 30ish damage, charring the cracked altar and completely incinerating myself and the orphan children. The Vampire finishes con-draining the cleric and gave the bardbarian a non-standard game over where, after vomiting blood to resurrect the aspect of Vecna, she fish slapped him to death with his own rib-cage. Vecna Wins. Fatality. Perhaps the most interesting thing about this was that apparently no one besides myself had ever played 3.5 before (or if they had, they’d never played with character builds this complicated?) and most of the players were completely baffled by the combat, had no idea how to make their characters do what they wanted them to do, did not know what numbers to add to what for base attack and damage, and it was something of a problem. This is not a criticism at all of the players, but a note that really high-character-level play is complex when you DO know the system, so it’s really hard on players new to a system to give them ridiculously complex and powerful character builds and expect them to be able to function without warming up to the system first. Playing the game at lower levels and the experience of leveling up lets players accumulate the knowledge of how their characters work and how the game works at nice incremental levels. I guess the thing that gets me is that since death was almost a certainty anyway, a simpler system for adjudication might have been more fun. I feel extra bad for the guy who died in the first round. Hell, we spent an entire evening, in a snow storm, for like 4 straight hours min-maxing and making obscure 3.5 gestalt classes so that dude could die in the first round of the game’s only encounter. So, I started reading Die, Vecna, Die! While I can’t imagine actually running this beast, it’s made for interesting reading. The scale of some of the encounters is insane and probably beyond my simple abilities to actually keep track of, considering that there are typically multiple named villains with a wide array of special magic equipment and several spells (as a lot of the baddies are Vecna cultists with mage or cleric ranks). If anyone has actually DMed this or run through it as a player, I’d love to hear some thoughts and stories. Tomorrow night, our DM is going to (hopefully) make good on his cackling promises that we’re all going to die. I don’t mind if I go out in the first round, because I’m about two in-game days worth of work towards finishing the new east tower of my castle in Minecraft. I’m not sure why we’ve been using the most combat-oriented variation of D&D’s second most combat-oriented edition for a game that, going into the 4th 5th and final session, will have had no encounters, and if we’ve been promised death, I’m not sure why we have these bloated 4 page character sheets anyway. I’d almost feel better if I didn’t have to roll the dice for it, at this point. While I’m not opposed to story-games, and have enjoyed some that I’ve been in, there are much better systems than d20. So far, we’ve spent a lot of time rolling dice in a library, hoping that eventually we’ll acrue enough successful rolls that eventually we’ll be told what we’re meant to know. The good thing about this being the final climactic conclusion is that, unlike if this were a text-based adventure game, at least one way or another it is going to end whether or not we figured out how to take ye flask. One other note, horror doesn’t work when the monster is the boogey-man from the book. It’s why I’d never play Call of Cthulhu; because in the end it’s always going to be Cthulhu (or some stupid August Derleth Cthulhu proxy). Now that we know that Vecna is somehow behind everything things feel like they are in full-on anti-climax mode. A Wishing Well is a highly evolved subspecies of Mimic that is drawn to sparsely populated areas. It’s lifecycle includes three stages. Wishing Wells reproduces by shedding one of the ‘stones’ from its rim; at night, this stone will roll to a secluded place until it reaches the second phase of its life-cycle. A Wishing Well is most vulnerable in the first stage of its life-cycle. It is immune all piercing and slashing damage, but can be destroyed by bludgeoning damage. It cannot attack and will always attempt to flee by rolling away and hiding among other similar looking rocks. After 48 hours, the single ‘stone’ will have grown to a circle of ‘stones’ about 5 feet in diameter and three feet in height. The Wishing Well will then travel, scurrying about quickly on hundreds of tiny crab-like legs, in search of a place to make its home. During its second life stage, the Wishing Well’s primary objective is to quietly and discretely find a place to plant itself; as such it will avoid confrontation, staying still if any humanoids are around. When still, it appears as a circle of stones about an undug pit. If it is discovered, it will run, knocking over anyone in its path. It is immune all piercing and slashing damage, but can be destroyed by bludgeoning damage. The Wishing Well becomes ‘mature’ when plants itself in the ground. The legs will burrows until it reaches an aquifer, expanding its gullet downward as it does so. 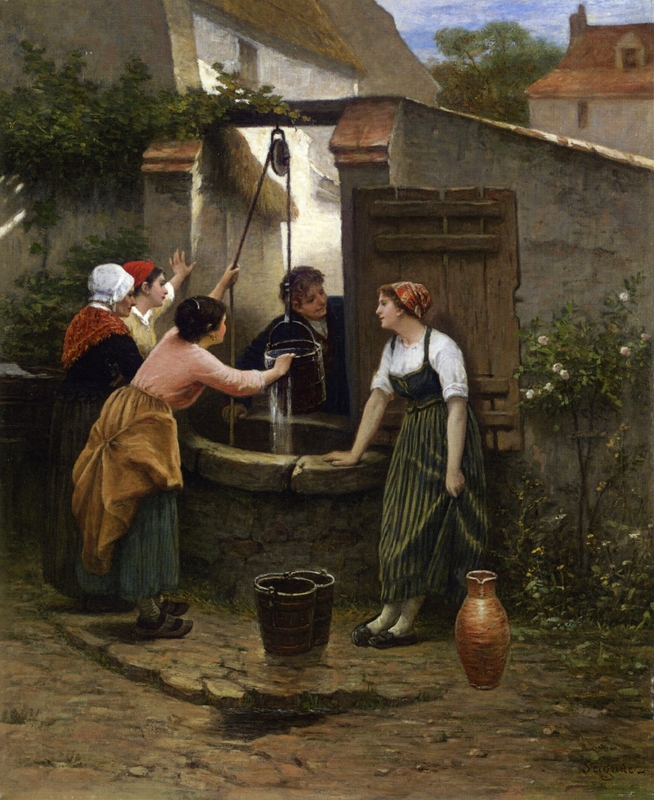 Mature Wishing Wells feed on children, who seem wont to fall down wells, and anyone who is lured by the prospect of the treasure to be found at its bottom. The Well’s gullet is incredibly slippery and cannot be scaled; even if a person has a rope, they will not be able to pull themselves out of the Wishing Well unless they have strength sufficient to lift their entire body without the aid of footholds (16+) or someone above assisting by pulling the rope. Anything larger than a normal bucket touching the side-walls of the Wishing Well’s gullet will alert the creature to its prey. The Wishing Well will rapidly (1 round) fill its lower gullet with water by opening and closing a sphincter-like organ and attempt to drown a person who reaches its bottom. The person must save vs paralysis or be instantly drowned. Successfully saving allows the tresspasser an attempt to lift himself from the well. If they are unable to lift themselves out of the well, they will eventually tire and drown. At night, the Wishing Well secretes digestive enzymes that dissolve the body, of which there will be no trace by morning. After consuming 5 victims, the Wishing Well will shed a stone; this part of the well does not regrow. Filling in its gullet is the only way to kill a mature Wishing Well. It should be noted, however, that this generally prevents any recovery of the treasure at the bottom of the Well. Wishing Wells are immune to sleep and charm magic, are not hurt by elemental damage spells. A Shatter spell will kill any Wishing Well in its 1st or 2nd life stage. Casting Shatter on a Mature Wishing Well will only destroy the above-ground portion of the creature, however this will render it unable to reproduce. Transmute Stone to Flesh will give a + 4 AC penalty to the Wishing Well in its 1st and 2nd Life Stages. This removes the Wishing Well’s immunity to piercing, slashing, and spell damage. Contrary to popular belief, Wishing Wells do not grant Wish, however Wish can be used to safely extricate any treasure the Wishing Well might possess. The amount of treasure at the bottom of a Wishing Well is determined by the population density of the area the well inhabits and how long it has been there.